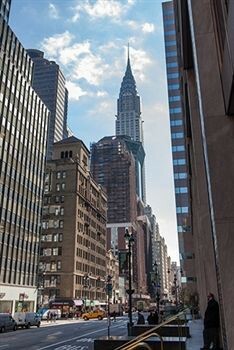 Property Location With a stay at Hotel Boutique at Grand Central, you&apos;ll be centrally located in New York, steps from Chrysler Building and minutes from Grand Central Terminal. This hotel is close to Rockefeller Center and Empire State Building.Rooms Make yourself at home in one of the 92 guestrooms featuring iPod docking stations and flat-screen televisions. Complimentary wireless Internet access keeps you connected, and satellite programming is available for your entertainment. Private bathrooms with showers feature complimentary toiletries and hair dryers. Conveniences include desks and complimentary newspapers, and you can also request irons/ironing boards.Rec, Spa, Premium Amenities Take advantage of recreation opportunities such as a 24-hour fitness center, or other amenities including complimentary wireless Internet access and concierge services. This hotel also features wedding services and tour/ticket assistance.Dining Enjoy a meal at a restaurant, or stay in and take advantage of the hotel&apos;s room service (during limited hours). Quench your thirst with your favorite drink at a bar/lounge.Business, Other Amenities Featured amenities include a 24-hour business center, a computer station, and express check-in.